Over the course of his career, John Montagu accomplished many great things as the 4th Earl of Sandwich. He negotiated treaties, served as a captain of a regiment, and sponsored a voyage through the Pacific Ocean. Thanks to his efforts, battles have been won, wars have been ended, and new countries have been discovered. 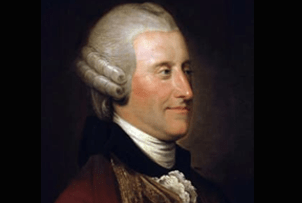 John Montagu was born on a sunny afternoon in November 1718 in Chiswick, England. When Montagu was just 4 years old, his father passed away after suffering for many years from a heart condition. His mother got remarried soon after his father's death, leaving him to be raised by his grandfather (the 3rd Earl of Sandwich). She would occasionally stop by for a visit, but she was not very involved in his life. When his grandfather passed away in 1729, he officially took over as the 4th Earl of Sandwich at just 10 years of age. In order to truly take on this new position, he had to get a proper education. He had 2 different tutors who would meet with him 6 days a week. One tutor focused on mathematics, reading, and writing, while the other tutor focused on history and science. Occasionally, other tutors would pay him a visit to make sure he was exposed to various kinds of art and music. When he was still a teenager, he spent several years studying at Eton College and Cambridge University. While he never earned a degree at either school, he was able to learn a lot through the many classes he took there. After he had finished his studies, he spent some time traveling, visiting the countries of Egypt, Greece, and Turkey before returning home. Finally, in 1739, he was ready to take his seat at the House of Lords; this would be the true start to his political career. He worked directly under the Duke of Bedford, who was a very wealthy and powerful politician at the time. Throughout his first 6 years in office, Montagu was only given simple tasks to complete. Then, in 1745, the Duke of Bedford recognized his growth and started to give him more advanced assignments. Montagu was sent to Holland to be the captain in the Duke of Bedford's regiment of foot, quickly getting promoted to 2nd Colonel of the Duke of Montagu's regiment of foot for his ability to perform well under pressure. He led his regiment to several different victories while serving as their captain. One of his most difficult assignments involved traveling to Breda in 1746 to meet with their congressmen. The leaders of Breda had been approached by several other noblemen, who were unable to convince them of a peace agreement. Montagu, who was known for being very persuasive, was able to negotiate the Treaty of Aix-la-Chapelle, which helped end the War of the Australian Succession. Montagu held a number of different positions throughout his career, including the British Ambassador to the Dutch Republic, the Postmaster General, and the Secretary of State for the Northern Department. He was known for giving long speeches that lacked eloquence but still got his point across. Through one of his famous speeches, he was able to convince his country that they needed to expand their Navy instead of deploying British troops. Another speech led to the prosecution of John Wilkes, a British politician that admittedly allowed people to bribe their way into office. As you can imagine, the life of a nobleman in the 1700s was very stressful. Montagu was able to deal with the pressure he was under by using gambling as a way to take his mind off things. Montagu first started gambling during his college years. His friends encouraged him to join them at the horse races, which is where Montagu placed his first bet. He bet on various horses from time to time but was always hesitant to spend too much money. When it came to betting on horses, Montagu was known for being very cautious. When he was older, he stopped betting on horses and dedicated his time to playing card games instead. He spent many evenings gathered around his card table, playing Euchre with his friends until the wee hours of the morning. His longest recorded playing session was over 24 hours long. While playing for extended hours, he would often ask his servants to bring him pieces of meat in between 2 slices of bread. It was a snack that he could eat with one hand while holding cards with his other hand. Those who competed against him started asking for, "the same as Sandwich," hence how the food item earned its name. Once Montagu started playing cards, he didn't know how to stop. He would often lose thousands of pounds in a single night as he tried hard to chase his losses. Those who were lucky enough to get invited to Montagu's house to play knew they would probably be stuck there all night, but they didn't mind, seeing as how they would probably be able to make a decent amount of money from him. Of course, Montagu didn't always lose. He once had such a long winning streak that he was able to pay for Captain Cook's voyage through the Pacific Ocean. While on this trip, Captain Cook discovered Australia and a group of small islands, which he went on to name "The Sandwich Islands" as a thank you for Montagu's financial support. Those islands are better known today as the islands of Hawaii. When Montagu wasn't involved in political affairs or out gambling, he could probably be found playing cricket. He was the captain of the Huntingdonshire County cricket team and was able to lead his team to victory on several different occasions. He was a very skilled wicket-keeper. Along with cricket, Montagu was very passionate about ancient music. He organized and funded the "Catch Club," where professional musicians would gather on a weekly basis to perform ancient and modern songs. Among those musicians was the well-known Italian violinist Felice Giardini, who Montagu personally sponsored throughout his career. Montagu had a very interesting love life. The first woman he fell in love with was Fanny Murray, an English courtesan. She was known as a fashion leader, often setting the trends for other wealthy English women. He stopped all contact with her once he married Dorothy Fane, the daughter of the 1st Viscount Fane. After they had been married for about 5 years, Fane gave birth to their first child, a son named John. He would eventually become the 5th Earl of Sandwich. Shortly after he was born, Fane developed some very serious mental problems. She was slowly becoming insane to the point where Montagu wasn't equipped to take care of her anymore. As divorce was not an option for that time period, Montagu sent her away to live at the Windsor Castle, where she would be looked after by a nurse for the rest of her life. Montagu's next love affair was with Martha Ray, a famous opera singer. Although they would never be able to get married, they did have several children together. One of their sons, Basil, grew up to be a lawyer who would be known for modernizing England's bankruptcy laws. James Hackman, who was jealous of Montagu's accomplishments, murdered Ray at the Royal Opera House in 1779. Montagu was devastated and neglected to pursue any other women after her death. Once Montagu retired in 1782, he moved into a small villa in Huntingdonshire County. He would spend almost every waking hour playing cards with anyone who would compete against him. His gambling addiction caused him to deplete his savings, and when he passed away on April 30, 1792, he was completely bankrupt. After Montagu passed away, he was described in this way by his close friend Lady Mary Fitzgerald: "Montagu needed ambition and vanity in order to succeed. He had a penetrating intelligence, a good understanding of character, and the ability to work with those around him. He had excellent judgment and the ability to foresee difficulties." Unfortunately for him, his good judgment was not something he used when it came to gambling. Montagu's gambling habits kept him up late at night and caused him to die without a penny to his name. They also led to the invention of the sandwich and the discovery of the Hawaian Islands. There's no doubt that his gambling habits had a huge impact on his life; whether that influence was positive or negative is really a matter of opinion.